Late summer crappies can be found in several different types of locations in a body of water. Mike Frisch caught this one in some vegetation. As the summer starts to wind down and fall gets closer, anglers should start thinking about some fall fishing strategies. Fishing opportunities for a wide variety of fish are outstanding in the fall across the Midwest. In many areas of the Midwest, crappies are abundant. Crappies are fun to catch and they’re great on the table. If you keep a couple of ideas in mind you should be able to have outstanding crappie action for the next few months. If you want to catch crappies, you’ve got to go to where they live. 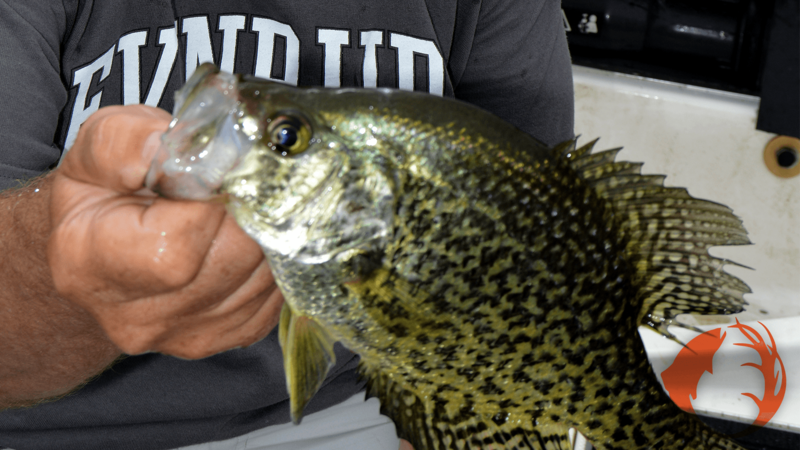 Crappie location will change from lake to lake depending on what kind of lake you’re fishing. Some lakes and reservoirs will see crappies using deep water out away from structure. They’ll be in the basin of the lake maybe thirty feet down. Often they’ll look just like walleyes on your sonar unit. On other lakes our quarry will be just off the edge of the weedline, while on other bodies of water they’ll be holding near brushpiles or manmade cribs. It will help you find the fish faster if you do some research before you actually hit the water. Ask around what types of areas appeal to the crappies on the lakes you’ll be fishing. If the lake you’re on is a brushpile and crib lake, you just need to fish around them with the appropriate gear. If it’s a weedline lake, you’re going to have to look around a bit for Mr. Papermouth. Cast to the weedline, but also be aware that frequently crappies will suspend out from the weedline thirty feet or so. Watch for dimples on the surface of the water. Minnows will often be out there eating plankton or bugs off the surface and the crappies will be just below eating the minnows. On basin lakes, you’re going to have to do some sonar work. Cruise the deep basin areas with a close eye on your depthfinder and believe it what it’s telling you. I have been so impressed with the different Raymarine units I’ve had on my boat for the past few years. They truly show you what’s going on below your boat. Watch for concentrations of fish life. If you see what you think are crappies right on the bottom, vertical jig them. If you see a concentration of suspected crappies suspended, back off and cast to them. Crappies near the surface can be spooky fish. When the crappies are on the bottom, tip a Gypsi or Fire-fly jig with a minnow and put it right on their nose. They usually can’t resist that presentation. When you’re casting, swim a two inch Impulse Swim’n Grub on a sixteenth ounce jighead through the fish. They usually can’t resist this set-up either. Use a light or medium-light action rod spooled with four or six pound test line for the ultimate in castability and sensitivity. P-Line CX Premium provides all the performance I need for this style of fishing and many others. When you get on a school of slab crappies, you’re going to have a good time. Keep enough for a meal if you want, but be sure to put some back. These schools can be fished down very quickly, and once you find out how much fun these crappies are, you’ll want to make sure there’s some left for next time.